In the 1990s, as the plight of Pacific salmon runs up and down the North American west coast rose in the public’s awareness, biologists in the U.S. identified four main threats to the future of the fish. These were presented as the Four H’s: there was Habitat (i.e., loss of, usually to forestry and development), Hydropower (especially the four dams on the Snake River), Harvest (too much of), and Hatcheries (i.e., competition with fish from). While it was generally understood that not everything plaguing the five salmon species (plus steelhead) would fit neatly into one of those categories, the Four H’s made a useful shorthand for a public perhaps less disposed to thrash through the complex managerial thickets of salmon recovery. But while much of the public’s attention has lately been focused on salmon runs from the Columbia River, where a federal judge just rejected—for the fifth time—a federal recovery plan, a subtler mystery has been unfolding a little farther to the north. Beginning in late 2009, scientists in the Salish Sea found that three species of its salmonids—the Chinook, the coho, and the steelhead—faced something somewhat murkier than the Four H’s. Somewhere between the time they would emerge from whatever watershed they hatched in, to the time they should return to it, many more than expected were dying. Since the 1970s, all three species have experienced ten-fold declines during the marine phase of their lifecycle—the time, that is, they spend in Puget Sound in the U.S., or the Strait of Georgia in Canada. The Salish Sea Marine Survival Project sprang from this revelation. The project, coordinated by two non-profit groups, the Pacific Salmon Foundation (based in Vancouver, B.C.) and Long Live the Kings (based in Seattle, Washington), seeks, as the two groups say, to leverage human and economic resources from both Canada and the U.S. to figure out why so many Chinook, coho, and steelhead are disappearing. Almost seven years later, more than forty organizations are involved in some capacity, ranging from the federal and state agencies, to academic institutions, to First Nation and Native American governments. With the survival of juvenile salmonids in the Salish Sea, such a diversity of approaches is more than necessary—relying on the Four H’s will not suffice. As such, biologists couch their key hypotheses for the salmons’ decline in terms of processes: “bottom-up,” “top-down,” and, as a kind of catch-all, “additional.” These they have parsed further into twenty-four specific hypotheses to evaluate (e.g., “Growth rates regulate survival at one or more life stages of Chinook and coho” or “The probability of being detected by predators decreases with the abundance of alternative prey”), generating a total of thirty-nine finer predictions (e.g., “Smolts that enter [the Salish Sea] during optimum food supply conditions perform better. Smolts that don’t survive worse.”). Some of these hypotheses and predictions address Puget Sound, and some the Strait of Georgia. But most apply to both. And as always seems to be the case with salmon, there are far more questions than answers. 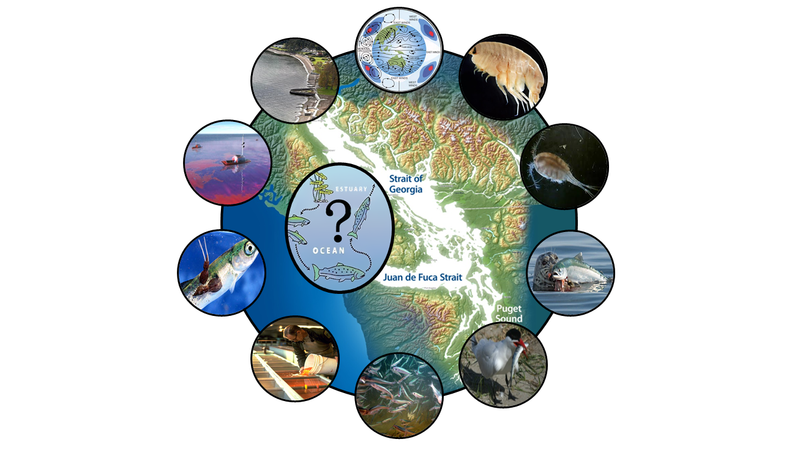 Last April, at the Salish Sea Ecosystem Conference in Vancouver, B.C, researchers from several key organizations came together for a day of information sharing. From the outset, it was clear how much remains to be learned about the system. “We currently lack sufficient information regarding water and other ecosystem properties on both temporal and spatial scales appropriate to understand a number of factors,” said Svein Vagle, a biologist with Fisheries and Oceans Canada (DFO). His was a sentiment oft repeated. The factors, Vagle went on, include nutrient cycling, variability in food supply, the movements of fish and their predators—knowledge gaps that comprise elements of basic natural history, in other words. Many of the currently ongoing projects, then, are investigations that seek simply to describe parts of the Salish Sea: an analysis of phytoplankton phenology in the Strait of Georgia, for example, or observations of ecosystem processes across multiple scales in Cowichan Bay, near the southern tip of Vancouver Island. Researchers also looked to see what prey was available to juvenile salmon, and when and where it is around. There were censuses of potential predators, as well, and from that an attempt to gauge the relative risk that juvenile salmon face. But scientists are also looking at the salmon themselves, testing ideas that might or might not explain why the fish are dying. 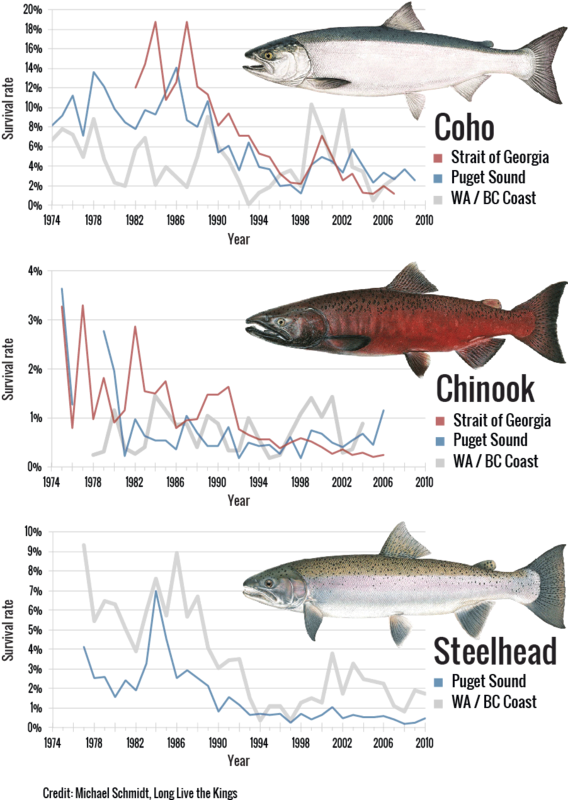 One pressing question is why Chinook, coho, and steelhead are in such dire straits, but pink, chum, and sockeye aren’t. A possible explanation, said Correigh Greene, a biologist with NOAA, is that the former three have a lengthier residence time in freshwater as smolts, among other life history variations. Similarly, Scott Hinch, a biologist from the University of British Columbia, looked at the differences in migratory behavior and pathways between sockeye and steelhead, and how that affects their respective survivals. Further complicating matters is that juvenile salmon aren’t the only creatures whose population dynamics are changing in the Salish Sea. Forage fish and some marine fish populations have gone down, as has the range of giant kelp and sea grasses. At the same time, others species are increasing: harbor seal, harbor porpoise, and white-sided dolphin numbers have all gone up. As has the human population, and with it, development. Maybe all of these are having an impact on juvenile Chinook, coho, and steelhead in some way. Maybe only some of them are. But which ones? All of which is to say that one of the major challenges facing scientists in the Marine Survival Project will be integrating all of these somewhat disparate investigations into a cohesive management strategy that will work in this transboundary system. At present, the project is in the midst of data gathering. Dissemination of the research, as well as using the results to begin to put together a management plan, is not expected to begin until 2018. The population size of steelhead in Puget Sound has decreased over the past 20 years, with current abundance at less 4% of historical levels. The numbers are so low that steelhead in Puget Sound were listed as threatened under the Endangered Species Act in 2007. The causes of this decline are not known. It is currently unclear if steelhead are dying as they leave the river, transit through Puget Sound, or while they are in the ocean. However, advances in technology are clearing the way to allow researchers to examine this problem. KING5: Why are steelhead dying?